Your group name is central to your group – this name forms part of the group email address which members of your group will use to communicate with the group. For example, if you’re setting up a group email list for your local book club, you may choose a name like monday-book-club this name will then form part of the address people use to reach your group i.e. monday-book-club@gaggle.email. 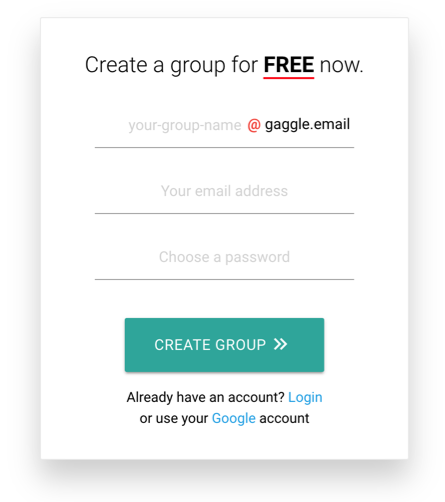 Since group names’ are key to your group you can’t change them once the group is created (a bit like when you get a new email address from Gmail - you can’t change it). The other details you enter are straightforward, your email address and a password. These are used to create an account which you then use to log in and administer your newly created group.